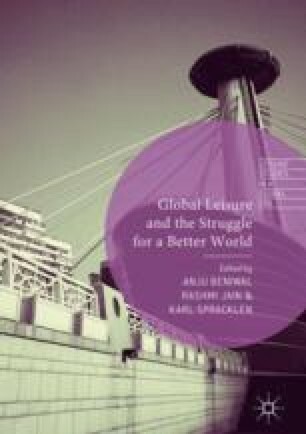 This chapter examines how leisure and tourism policy and education might promote social good in Japan. Rural activities as leisure pursuits are changing historical trends in Japan. Before the Green Tourism Law of 1994 was enacted, tourist-oriented agricultural activities such as fruit picking and livestock experiences on farms were popular among urban residents. Rental farmland near urban areas was also already popular. In addition, some more remote rural areas such as Touno (Iwate Prefecture), Ajimu (Oita Prefecture) and Iida (Nagano Prefecture) developed rural tourism by using farmers’ houses. However, the enactment of the Green Tourism Law spurred the nationwide spread of green tourism development. Educational rural tourism is also being developed throughout Japan. Some small communities such as Ojika (Nagasaki Prefecture) and Suo Oshima (Yamaguchi Prefecture) already invite high school students to experience the rural way of life. After their success, many rural municipalities are following the same path. The rural way of life could be used to attract international tourists as well. Gakkai Nenkan. (n.d.). Kensaku. https://gakkai.jst.go.jp/gakkai/. Accessed 1 June 2017. JASSO. (2016). Heisei 27 Nendo Gaikokujin Ryugakusei Zaiseki Jyoukyou Chousa Kekka. http://www.jasso.go.jp/about/statistics/intl_student_e/2015/. Accessed 1 Mar 2017. JOES. (n.d.) History. http://joes.gr.jp/?page_id=1535. Accessed 1 Mar 2017. JTB. (n.d.). JTB Group no Kyouiku Jigyou. http://www.jtbcorp.jp/jp/colors/detail/0063/. Accessed 1 Mar 2017. Kodomo Nousangyoson Kouryu Project. (n.d.). Homepage. http://www.kodomo-furusato.net/. Accessed 1 Mar 2017. Ministry of Agriculture, Forestry and Fisheries. (2016). Shimin Nouen wo Meguru Jyoukyou. http://www.maff.go.jp/j/nousin/nougyou/simin_noen/zyokyo.html. Accessed 1 Mar 2017. Ministry of Education, Culture, Sports Science and Technology. (n.d.). Seishounen no Yagai Kyouiku no Jyujitsu ni Tsuite. http://www.mext.go.jp/b_menu/hakusho/nc/t19960724001/t19960724001.html. Accessed 1 Mar 2017. National Institution for Youth Education. (n.d.). History. http://www.niye.go.jp/english/history/. Accessed 1 Mar 2017. Nihon Recreation Kyoukai. (n.d.-a). Recreation Undo no Rekishi. http://www.recreation.or.jp/association/folder/. Accessed 30 May 2017. Nihon Recreation Kyoukai. (n.d.-b). Ayumi to Enkaku. http://www.recreation.or.jp/association/transition/. Accessed 1 June 2007. Nihon Recreation Kyoukai. (n.d.-c). Kounin Shidousha Suu. http://www.recreation.or.jp/association/coach/. Accessed 1 June 2007. Study Sapuri (n.d.) Keyword Search. http://shingakunet.com/. Accessed 1 June 2017. Tokai University. (n.d.). School of Physical Education. http://www.u-tokai.ac.jp/english/academics/undergraduate/physical_education.html. Accessed 30 May 2017. Yamaguchi University. (2015). Gakuhou No.141. http://www.yamaguchi-u.ac.jp/info/_3120/_4187/_4675.html. Accessed 29 Jan 2016.